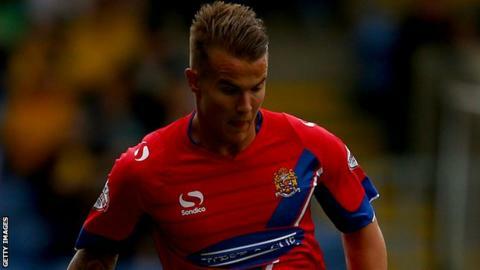 Frankie Raymond, Matt Partridge and Jodi Jones scored their first senior goals as Dagenham thrashed Accrington. Raymond crossed for Partridge to head home in the first half before supplying Jamie Cureton with his 18th league goal of the season to make it 2-0. The 22-year-old then curled in a free-kick from 20 yards and Jones completed the rout in the 90th minute. The Daggers move up two places to 13th while Accrington, in 17th, have now won only once in 13 games. Match ends, Dagenham and Redbridge 4, Accrington Stanley 0. Second Half ends, Dagenham and Redbridge 4, Accrington Stanley 0. Corner, Accrington Stanley. Conceded by Scott Doe. Goal! Dagenham and Redbridge 4, Accrington Stanley 0. Jodi Jones (Dagenham and Redbridge) left footed shot from the centre of the box to the top left corner. Assisted by Jamie Cureton with a cross. Ian Gayle (Dagenham and Redbridge) is shown the yellow card. Matt Crooks (Accrington Stanley) wins a free kick on the left wing. Corner, Dagenham and Redbridge. Conceded by Adam Buxton. Jack Connors (Dagenham and Redbridge) wins a free kick in the defensive half. Max Hazeldine (Accrington Stanley) wins a free kick in the defensive half. Corner, Accrington Stanley. Conceded by Matt Partridge. Attempt missed. Jodi Jones (Dagenham and Redbridge) right footed shot from the centre of the box is too high. Attempt blocked. Jamie Cureton (Dagenham and Redbridge) right footed shot from the centre of the box is blocked. Substitution, Accrington Stanley. Max Hazeldine replaces Shay McCartan. Substitution, Dagenham and Redbridge. Jack Connors replaces Andre Boucaud because of an injury. Goal! Dagenham and Redbridge 3, Accrington Stanley 0. Frankie Raymond (Dagenham and Redbridge) from a free kick with a left footed shot to the bottom right corner. Jason Gilchrist (Accrington Stanley) wins a free kick in the defensive half. Substitution, Accrington Stanley. Jason Gilchrist replaces Piero Mingoia. Danny Whitehead (Accrington Stanley) wins a free kick in the defensive half. Frankie Raymond (Dagenham and Redbridge) wins a free kick in the defensive half.